Portable Bluetooth speakers come in many different forms. There are super compact ones meant to fit in your pocket, while there are also levitating ones which can be described as space magic. 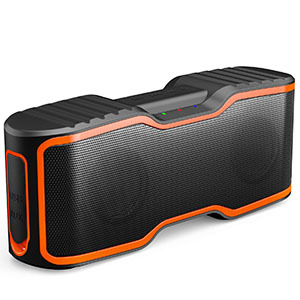 However, there’s one type of non-standard Bluetooth speaker that has a valuable purpose and those are waterproof Bluetooth speakers. Today we are going to show you some of the best Bluetooth speakers designed to deal with water and talk about their limitations. Mixing audio electronics and water wasn’t even possible not so long ago, but these days you can take your favorite songs with you to the pool. One of the best designs for outdoor use. Comes with a battery which offers 12 hours of use. IPX7 rating allows you to submerge the speaker. Great overall sound quality and volume. Tends to roll around a lot. 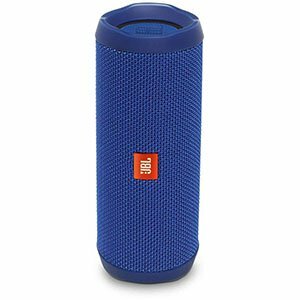 JBL’s wireless Bluetooth speakers are easily some of the best on the market right now. They’ve found that fine line between optimal performance, good aesthetics and overall functionality. One model that really deserves the mention whenever waterproof speakers are mentioned is the JBL Flip 4 Waterproof Portable Bluetooth Speaker. This bad boy is made to handle anything outdoors and indoors. From the aspect of this guide, JBL Flip 4 offers the most advanced level of water resistance rating found on these speakers. We’re talking IPX7 which means that you can submerge it for short periods of time. Combined with 12 hours of battery life and a really good sound quality, there isn’t much we would like to change on it. One of the most rugged and durable speakers out there. IP67 rating makes it waterproof and dust proof. Great sound for such a small speaker. 40 hours of battery per charge is impressive. Not the prettiest speaker by any means. This rather unusual looking speaker may be just what you were looking for. Sure, its looks are an acquired taste, but that rugged exterior should give you a hint on what to expect from this bad boy. Fugoo Tough Portable Waterproof Speaker is about as solid as it gets with small, affordable waterproof speakers. It is a true outdoors-man’s speaker. What makes it interesting to us is the fact that it carries the IP67 rating. In other words, it is water resistant, submersible and resistant to dust as well as other particulates. Here’s the kicker, it comes with a 40 hour battery. Yup, it will last you two days without rest. On top of all that, the sound is great. Very functional design which makes it easy to use. A good selection of hardware and a good driver. Decent battery life and fast charging times. IPX7 water resistance rating makes it submersible. Not the most powerful speaker out there. The current market is full of purpose built Bluetooth speakers. However, very few are offering what ECOXGEAR EcoXBT does. This model is made for use under harsh conditions. That much is apparent just by looking at it. It’s functional design aside, you will find this thing to be quite a performer. Especially if you are on a somewhat limited budget. AT the core of EcoXBT is a good driver that has plenty of range and even more finesse. Paired with a 10 hour battery, it really does a good job with volume as well. In terms of water resistance, EcoXBT features the IPX7 rating, which makes it fully submersible. Naturally, there are limitations, but this speaker is generally pretty solid. A very compact speaker that features a spherical shape. IPX7 rating ensures water resistance. Good sound for such a tiny speaker. 10 hours of battery life is pretty great. Volume isn't all that great. Bluetooth speakers come in shapes and sizes. That much is known. However, most of them seem to follow the same layout for the most part. Ultimate Ears WONDERBOOM is one of the few who don’t. Instead, Ultimate Ears went with something that is functional, practical but every bit as good as some of the flagship models on the market currently. It is a tiny speaker, there’s no doubt about that. That small size combined with its almost spherical shape make it a great companion outdoors. The IPX7 rating ensures the best water protection you can get in these devices. On top of that, you’re getting a very decent sound quality as well as 10 hours of battery life on average. A simple design that has been proven to work. Pretty decent sound quality all things considered. Features a 12 hour battery and fast charging time. IP67 rating makes it one rugged outdoor speaker. More volume would have definitely been appreciated. Sometimes simple designs are just the best way to go. 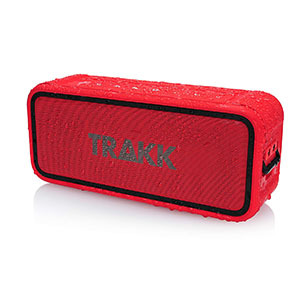 TRAKK’s TR812RD Go 20W comes to mind as one such speaker. Although just about every other speaker looks almost exactly like this, there’s a lot of merit to using a standard boxy design. It is cheap to a point where it allows the brand to focus on more important things. The driver behind the flashy mesh is pretty solid, loud and packs enough range. However, it’s worth noting that it doesn’t pack an endless amount of volume. Then again, it’s to be expected with compact models such as this one. One good thing is the IP67 rating. That plus the 12 hour battery make it pretty competitive at this price. A small, functional design which is great for various activities. Plenty of protection from both bump damage and water. Good sound for such a small device. Decent battery life considering its size. Very limited volume when used in noisy environments. We have all heard of action cameras, but there are also action speakers. 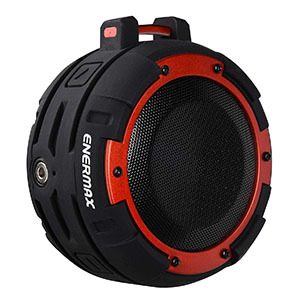 Enermax EAS03-BR O’marine Waterproof Wireless Speaker is one such model and it packs a pretty interesting set of features. This is a small device, but that is definitely an advantage considering its purpose. It was designed to be with at all times no matter what you’re doing. Such a tiny speaker has to have some limitations, right? Well, the only thing we have found is the lack of power. It is powerful, but don’t expect deep basses and cutting mids. Instead, you are getting 5 Watts of good sound that can be submerged up to 2 hours. The battery life is also pretty decent all things considered. Functional and simple design which works. Splash proof making it a good choice for poolside use. Good battery life and fast charging time. Good sound quality with a decent amount of volume. Vtin is another brand that just happens to produce some of the most interesting waterproof speakers in the wireless segment. 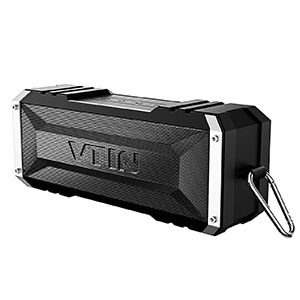 The one we would like to address today is the Vtin 20 Watt Waterproof Bluetooth Speaker. Simple yet stylish in design, this thing will get you the performance you need at a very competitive price point and that is impressive. What we have here is a robust looking speaker which features water resistance. Now, the actual rating is unknown but according to Vtin it is splash proof rather than water proof. In other words, not something you’d want to submerge. The sound quality is decent, which can also be said about the 25 hour battery life. Overall a great bargain. One of the best bang for the buck speakers. A great looking design which is also pretty functional. IPX6 protection rating makes it water proof. Good battery life and decent sound quality. Could have used a bit more power. Cheap Bluetooth speakers often times look mediocre at best. However that is more of a trend rather than a rule. 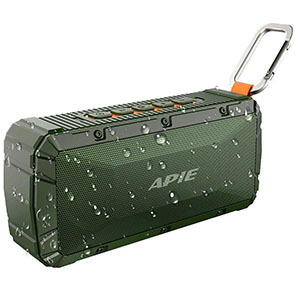 There are speakers such as the APIE Portable Wireless Outdoor Bluetooth Speaker which bring both the good looks and decent performance to the table. At this price, it is packs a lot of bang for your buck, that’s for sure. Everything about this speaker is well rounded. You have the IPX6 rating for water resistance, which makes it good for pool side use. Then there’s the capable full range drive that packs plenty of power and a good range. Finally, we have the 10 hour battery that charges rather fast. Overall, it is a pretty good deal on a budget. A simple yet functional design. Plenty of power running through twin drivers. Good battery life which offers 12 hours of use. Good sound quality all things considered. Not the most exciting looking speaker out there. If you are on a budget but you insist on getting the best possible water resistance rating on the market, AOMAIS Sport II is the speaker you are looking for. It is light, packs a mean punch and can be submerged for up to 30 minutes. At this price, that is what you call a bargain. It is that good. One thing to note is that Sport II isn’t the best looking thing out there. However, that’s something we can live with. The twin full range drivers inside is decent, offer good volume and plenty of range. The IPX7 rating is a truly impressive spec for such a cheap unit. On top of all that there’s the 12 hour battery. Just How Waterproof Are These Speakers? The first thing you need to know about waterproof speakers is that they are certainly not waterproof. There are only varying levels of water resistance. If you have looked over several speakers in this category, like the ones we have listed above, you have probably noticed different IP certifications. IP certifications are a set of standards that govern the level of protection built into electronics. This doesn’t only apply to water resistance, but also dust resistance, impact resistance and similar environmental factors that can damage your tech. Each IP certificate brings a certain level of said protection. 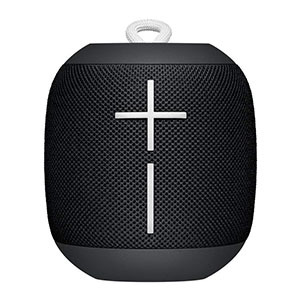 For example, IPX5 is the most common one and many of the best Bluetooth speakers have it. IPX5 belongs to the lower protection levels. It offers water jet protection, or in other words, exposing your speaker to rain for a short duration of time. Then there is IP66 which boosts protection considerably and offers particle protection as well. Then there is IPX7 which means you can submerge the device at 1 meter of depth. 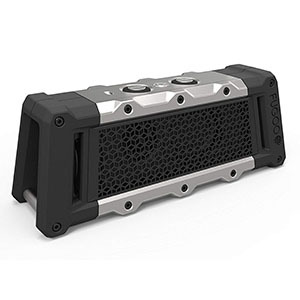 An IPX7 certified Bluetooth speaker will deal with high-pressure water jets, being submerged and similar. Naturally, this certification increases the cost of the speaker so don’t be surprised if a model with that spec sits at the very edge of the $200 price range. Choosing a water resistant Bluetooth speaker comes down to which water related activities you plan on participating in. If you simply need something that will work in the shower, there are plenty of great models out there which will get the job done at a reasonable price. However, if you need a speaker you can drop in the pool and not worry about it, you will have to aim for the higher IP rating. A great thing about water-resistant Bluetooth speakers is that some of them offer really good audio quality. It’s not like you’re losing anything by getting a water resistant speaker. Water-resistant Bluetooth speakers increase the versatility of this popular to a point where the sky is the limit. If you get one that features highest IP certification, you’ll have a reliable source of audio even in the harshest of conditions. The only thing to remember is that no IP rating will save your speaker from reckless handling. In other words, if it is capable of resisting exposure to water, that doesn’t mean you should deliberately throw it into the pool just for fun. 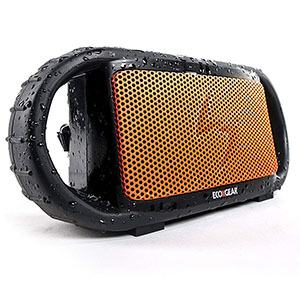 Water resistance in Bluetooth speakers is there as a fail-safe mechanism that prevents damage in case of an accident.